Dressing up ought to be a chance to let the imagination run riot, but marketing offers narrow roles for girls and boys to play. Megan Perryman takes a look. Are you filled with excitement or dread as you plan your children’s Halloween costumes? For me, it’s a bit of both as I attempt to fight against the sexist messages that saturate the fancy dress industry. This summer my daughter attended a summer camp which had a fancy dress theme of “Pirates and Princesses”. It’s an odd theme when you think about it. Are there many pirates knocking about Kensington Palace? Or princesses sailing the seven seas? What’s wrong with just having a “Pirates” theme or “Princes and Princesses” (or “Kings and Queens” for that matter)? Someone has clearly decided that pirates are too rough for girls and fairytales too delicate for boys, and decided to merge the two themes to be on the safe side. What a limited view of the world. My messy, noisy, boisterous daughter could not be further from the princess ideal. And she normally chooses some pretty cool fancy-dress costumes. But this time, because she understood the implication of juxtaposing those two themes, she felt she needed to be a princess to fit in. No amount of persuading on my part would work, so her pirate costume sat sadly in the wardrobe while she took part in a day of sports and activities whilst wearing a floor-length pink gown. I don’t particularly have a problem with princess dresses themselves. (It’s hardly a career, but then neither is gorilla, which is what my daughter wore to her school disco). My problem comes from the proliferation of princess costumes (and superheroes for the boys) and the implications this has for what it means to be a boy or a girl. If you look at any fancy dress display, the message to children is clear: boys should be superheroes – brave, active, extrovert, and girls should be princesses – pretty, quiet, restricted. This limits both boys and girls, and stops them from being the people they really are. 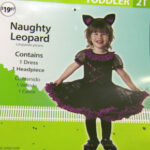 Marketing images for fancy dress costumes often picture the boys having fun while the girls are demure. The Argos catalogue (pictured above) makes a clear distinction with a blue page of superheroes in legs-apart powerful poses facing off against a pink page of girls posing prettily in their princess dresses. 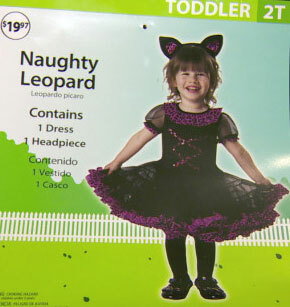 An even more sinister element is the sexualisation of girls’ fancy-dress costumes, such as the “naughty leopard” toddler costume recently withdrawn from Walmart following parents’ complaints. And why have one version of a costume when you can double your profits by having two? 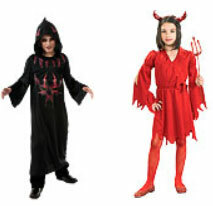 I recently noticed two different ‘devil’ costumes available from www.partydelights.co.uk – under their ‘boys’ selection there is one “for your little hell raiser” featuring a scowling boy beneath a hooded cloak covering most of his body. In the ‘girls’ section is one for “the cutest version of the devil” which shows a girl in v-neck and a short skirt, hand on hip in an adult-looking pose. It’s not just the fantasy costumes that are problematic. How many times have you seen a picture of a boy wearing the doctor’s outfit and a girl wearing the nurse’s? How many times have you seen a “Policeman” or “Fireman” costume, despite their real-life counterparts having long been renamed? Children can only aspire to be what they know is possible, and I want both my children to think big. The Smyths toys website clearly demonstrates their expectations of boys and girls. The costumes featuring girls on their “dress up” and “costumes” pages include ten princesses, a fairy, bride, ballerina, witch, ‘diva’ and nurse. Their boys are a soldier, cowboy, vampire and (bearing in mind the girls had a nurse’s costume) two doctors. At five, my daughter’s old enough to understand what this means. She soaks up the messages being given to her by retailers and manufacturers and I don’t like it. As I watch her one-year old brother sashay through the living room wearing costume jewellery and some pink sparkly shoes from the dressing-up box, I recognise that, sadly, he’ll soon learn that some grown-ups don’t think it’s okay to just have fun and be yourself. It hasn’t always been this way. For a long time, fancy dress costumes were as varied as a child’s imagination. With many families in the past having a mother at home with basic sewing skills, knocking up a fancy dress costume was part of being a parent. My mum made most of our costumes herself despite the pressures of full-time work because there weren’t many other options out there. 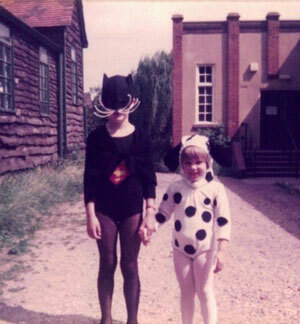 Aged eight and four, my sister and I won a fancy dress contest as “Supercat” and a dalmatian dog. With the promise of an untapped market, the proliferation of Princesses vs Superheroes had begun. So what can we do as parents to break things up a bit and make sure our children think big? Well, for one, complain. Tell retailers and manufacturers they’ve lost a customer. And if you have the time and ability, create your own costume. If you have girls, a great place for inspiration is the A Mighty Girl website. And if, like me, sewing is not your forte, let them experiment and challenge their assumptions. We’ve seen some great postmodern creations in our house, from Princess Spiderman to the Fairy-Monkey. I spend time looking online for interesting ideas based on the things that she likes. And for this Halloween? This year we’ve turned to Hogwarts for inspiration and she’ll be dressing as her hero: the clever, brave and unconventional Hermione Grainger. 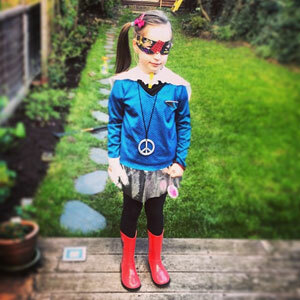 Megan has also written about fancy dress on the joke.co.uk site.